Do you enjoy antiquing? I have spent many days out and about with a dear friend of mine, Melissa Mandolf Smith, who has taught me how to comb through many antique malls looking for items to collect and get inspiration from. Melissa runs an online store at Ruby Lane called Time in a Bottle, selling her unique and gorgeous perfume bottles, which have been in several motion pictures, magazines, and shows. 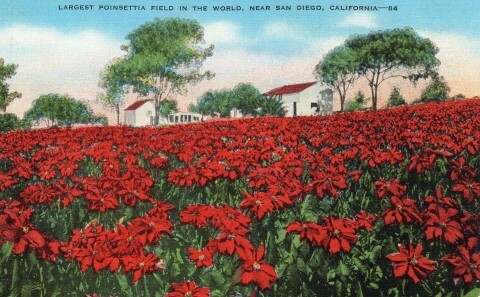 The poinsettia, known as America’s Christmas flower, is in full bloom in San Diego during the Christmas season. Each year J.E.Dryer president of the San Diego Heaven on Earth Club, makes free public distribution of thousands of poinsettia cuttings. Today, the Paul Ecke poinsettias are a vibrant red with large billowy leaves and extra-large global blooms. They are the original flower and can be found at many of your special garden stores. This display is in my local Armstrong Garden Center. You can learn more about these plants at the Paul Ecke Ranch in Encinitas, California. Antiquing with Melissa and Michelle in Temecula! The City of Temecula in San Diego is proud of it’s large antique malls and shops in their downtown area. If you follow their calendar they have many special events throughout the year celebrating the olden days of their historical buildings and traditions.